I am using TeXworks bundled in the MiKTeX distribution and the Fan­dol Simplified Chinese font family (available in TeX Live and MiKTeX). However, the Fan­dol font is not rendered in the TeXworks PDF viewer. On the other hand, Adobe Acrobat Reader DC is able to render the generated PDF file. LaTeX Font Info:    Redeclaring font encoding TU on input line 82. LaTeX Info: Redefining \itshape on input line 3910. LaTeX Info: Redefining \slshape on input line 3915. LaTeX Info: Redefining \scshape on input line 3920. LaTeX Info: Redefining \upshape on input line 3925. LaTeX Info: Redefining \em on input line 3955. LaTeX Info: Redefining \emph on input line 3980. LaTeX Info: Redefining \- on input line 4034. (fontspec)             'FandolSong-Regular' with options [Ligatures=TeX]. LaTeX Info: Redefining \rmfamily on input line 5. Output written on FandolTest.pdf (1 page). 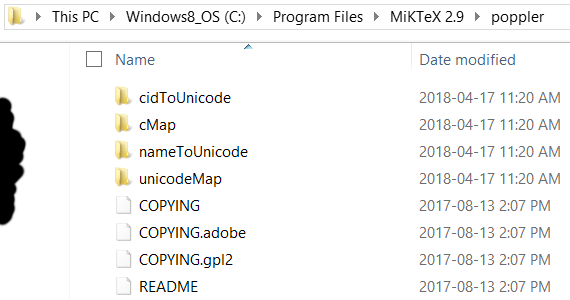 There appears to be a difference in the way MiKTeX compiles the inbuilt copy of TeXworks versus the Standard release and TeX Live copies although they all use the same version of source code they each tend to use different QT versions for graphics engine. In this case I recommend that unless you have other reasons for switching editor or viewer (I would suggest you can replace the internal viewer with say SumatraPDF as a good solution to this bug) that you temporarily use the Standalone version of TeXworks until MiKTeX address the viewer fonts issue. Personally I would use and reconfigure the zip (portable version) since it would be easier to delete once the MiKTeX version is updated, however that requires you add the "settings" that MiKTeX needs to the Typesetting preferences (you can cut and paste entries from one to the other) The alternative is to use the installer setup and let it do most of the work then just check between the two for any minor differences. Not the answer you're looking for? Browse other questions tagged texworks viewers or ask your own question. Wrong rendering in PDF viewer? PDF viewer with dual page option?